Home » Blogs » brad's blog » Can we get rid of touts/hawkers at tourist sites with a medallion? Can we get rid of touts/hawkers at tourist sites with a medallion? So many of the world's great sites are made much worse by the presence of "touts" (also known as hawkers, souvenir sellers etc.) particularly the ones who are pushy, constantly talking to you to advertise their wares, or even getting in your way. They can range from those who just fill the site with cheap souvenirs to those that constantly try to start a conversation with you about something else as a way of catching you off guard. I don't think that many nations and great sites understand just how much the touts detract from the quality of these places. Sure, the great site is still the great site, but it's a much less pleasant experience after 143 people have all tried to sell you a selfie stick, as though you are finally going to buy from the 144th. But clearly some people do our the touts would not be there. This is most strong in areas of lower income, where labour is cheap and tourists are comparatively super-wealthy. Even getting a tiny fraction of the rich tourists to buy high-margin junk (or even non-junk) makes almost any amount of disturbance worth doing to the impoverished sellers. Governments could just try to ban or regulate the touts, and some places do, but in some places they clearly don't want to; selling like this is a vital source of tourist income for the poor in some cases. In some public spaces it is hard to legally ban the touts, and in many places the well behaved touts are an asset, selling drinks or other useful items without harassing. And while I myself can't fathom why, many tourists like to shop even more than they like to visit the popular sites. But nobody likes touts that harass the tourists endlessly. Touts are much less common in higher-income places, and in fact vendors there are usually highly regulated. My hypothesis is that the negative value of the touts far exceeds the gain for the local economy, which is to say that I think many tourists would, if given the option, contribute more to help the local poor than is made by touts for the opportunity to enjoy tourist sites tout-free. To carry this out, one idea would be to develop a special badge, pendant or other symbol that tourists could buy and wear. It would mean "no soliciting." Tourists would buy it and the money would go to support the local economy, but at the same time, people who look like tourists would also walk through the areas wearing the medallion, arresting and punishing anybody who approached them trying to sell. The simple core idea faces a number of complexities. There would be a strong motive to forge these medallions, since they would sell for a fairly high price. You might need to make it so they can only be bought at special official shops. Unfortunately, since a forgery that looks like the real medallion is just as effective at keeping away the touts, it is not clear what verifying authenticity would mean -- if it looks real it is real. Those who care about helping the locals the official way would buy at the official shops, but forgeries would be available for half price by other means. This is a shame because there is a certain irony in the idea of having touts sell the medallions. They would be free to harass people not wearing the medallions, and this would encourage people to want to buy them. One approach would be to have the medallions change every day, and be difficult to forge on short notice. The word would have to go out on each day's form. If the medallions are relatively expensive, this could allow a hard to forge design. Tourists could also pay a deposit on medallions and return them for a partial refund. One anti-forgery technique might be digital, expecting that tourists will all have smartphones. The medallion could be a bluetooth device. It might emit pulses of light (IR or visible) which cameras can detect so any forgery is spotted if you ever walk past an enforcement camera. When you buy it, your phone can tell you if it's genuine -- in fact your phone loads the codes for the day into it. Any time you go past a gate or scanner, a forgery would be spotted, even if it fools the touts. If tourists pay for these medallions, you need the money to replace the money that used to push the touts to harass. The problem is, how do you distribute it? You could give it to the touts who are obeying it, but then everybody could stand up and say, "Why don't I get paid, I'm not harassing the tourists?" It's as though you are rewarding those who caused the problem. There is also a bit of a protection racket aspect to this. You're paying the people who were harassing you for protection from harassment. If the touts can sell the medallions and daily codes, then of course the money flows to them and they are incentivized to sell them and obey them. It might be better though if it were somehow put out into the communities, rewarding people who didn't harass the tourists. Everybody wins in the tourists are not harassed, since they are more likely to come. This is just a preliminary thought, and I welcome other ideas around this theme. When I read the title of this entry, the first thing that came to my mind was a medallion for vendors to limit their number, which I think might be helpful. But a medallion for tourists, a badge that says literally "I'm a rich visitor, leave me alone" seems to me extremely elitist. And also would be a handy "Rob Me" identifier. I would not wear one. Medallions for sellers would have less of a forgery and distribution problem because presumably there would be fewer of them, and turnover would be lower. Perhaps they could be issued by lottery on a daily basis to help more sellers benefit from a limited supply. Holders of legitimate medallions would have incentive to report forgeries. Providing some education or guidance to sellers might be helpful. I suspect many touts are copycats. If a potential tout sees 143 other touts selling selfie sticks, he might think, "Wow the market is huge, I need to get in on this" and becomes the 144th. Or maybe he just doesn't have any other ideas. Helping sellers find more desirable wares or services would benefit both sellers and visitors. Medallions for the touts, not the tourists. Or just an enforced perimeter, like on voting day in the US, past which there is no hawking allowed. This is the reason I don't like to go to any of the crowded and poor tropical beaches, because I can't stand the begging and selling (we do give to charity so I don't feel the guilt). I loved Curacao where the standard of living is high enough so you don't get approached, the people who live there go to the same casinos as the tourists, and blacks and whites intermarry regularly. Shaping one's vacation around a culture that is relaxing to be around is a nice feeling. We found the beaches at Exuma in the Bahamas to be lovely and harassment free, but the food was terrible. You agree what I wrote in "Any place is......". You are not going to a beach, you are going to a country that you like for any reason, that have a beach that you also like. May be you like more another beach, but you do not like the country for some reason, for your vacations. Each country knows how much they depend from the tourist expenses, so they do what they suppose is enough for avoid too much harassment to the tourist. May be if we do not spend money in weapons and casinos, we could live without people begging. Distributing the income from the tourist owned medallions would be extremely difficult challenge. Suddenly everyone in the community would be a tout, wanting a piece of the action. Educating the locals, with perhaps some monitoring to keep overly pushy touts in check is the better solution. The problem is, there is no problem, as far at the local population/government are concerned. As long as people keep coming to see the local ruin/attraction, why would the government care what the local touts are doing? Like Brad said, the government sees these people as gainfully employed, helping to contribute to the local economy, pulling more money from the tourists' pockets. I suspect that it is so ingrained in the local culture, changing it is near impossible anyway. Some places do regulate touts. Other places don't appear to wish to do that, so this idea is a lesser way of doing it. It lets them be there, and to harass those who have not contributed to the medallion fund. When you visit a place, touristic place or not, you are visiting a country. A country can have good things or not, that depends of the point of view of the tourist. And each country offers what they have to offer, it is not only the Statue of Liberty, pyramids, a glacier. People see places, interact with the local, and buy things. The tourist want to take something from the place he is visiting. Can be a video, a local food, a handicraft, a harassment. There was a film about USA tourists visiting Europe. The tour took them to a fast food place. One tourist says " I want to eat what the local people eats". The local people do not eat here, was the answer. The Victoria, Iguazu, Niagara falls, are in a country (or 2). Do you want ONLY to see the water?. When you visit a country the travel agencies, airlines, hotel, restaurant, and so on, get benefits. Each country can let other people too, to get benefits, in the way they can get. A few decades ago beggars in India asked the government to eliminate the 1 rupee coins. It is not necessary to explain why. In Nepal and India you could by a T shirt printed with " No 1 rupee, No change money, No hotel, No rickshaw". Do you think it was a good no-harass medallion?. Yes Brad, I agree that is not nice the harassment. But the way is not to forbid it, just to build the conditions so people all around the world can eat everyday without harass others. I believe than robots can help a lot if we can manage the tings properly. The more visited places from tourist are the airports, right?. No problems there, but airports are not placed in any country. Just go outside the airport, not in an private limousine, and you will be in a country. When you go to a bar and a girl asks you to buy a drink for her, is harassment, when you walk along a street and a girl grab your arm and says: Massage...?, this is harassment. Yes, people want to buy. And they will patronize the souvenir stands and the people who are sitting there with their goods. It's the constant, "Do you want to buy same thing 100 other people asked you to buy?" and, "Hi, where are you from?" that destroy the serenity of these great places. Let me buy what I walk by and see and want, don't harass me to no point. In my mind 2 PERFECT examples of this are the difference between Nassau, Bahamas and Bermuda. Both have equally beautiful scenery, weather, waters, and beaches....but in Nassau you are hounded terribly. In Bermuda its a completely different experience. I *much* prefer visiting Bermuda over Nassau for this very reason. 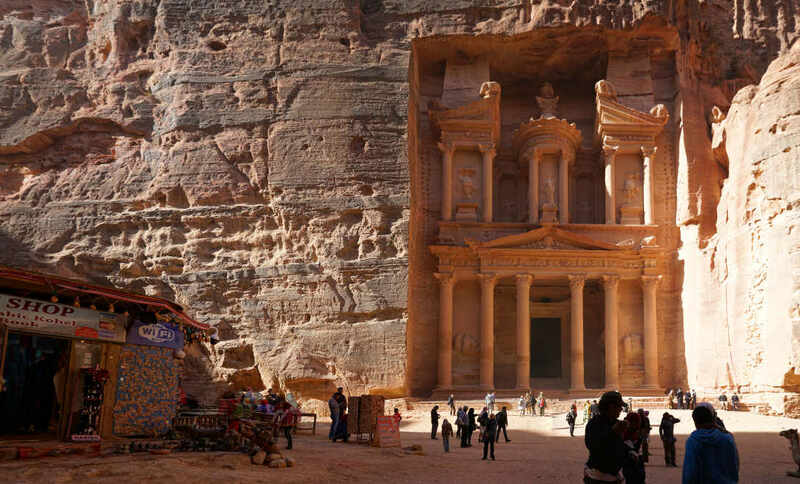 Petra Jordan is just really fabulous to explore out and to enjoy something really great with traveling around Jordan.